Using the work that I have been doing towards my woodcut designs and developing a simplistic design similar to the styles seen in Indian paintings and Japanese wood block print, I have developed a design for my screen print. 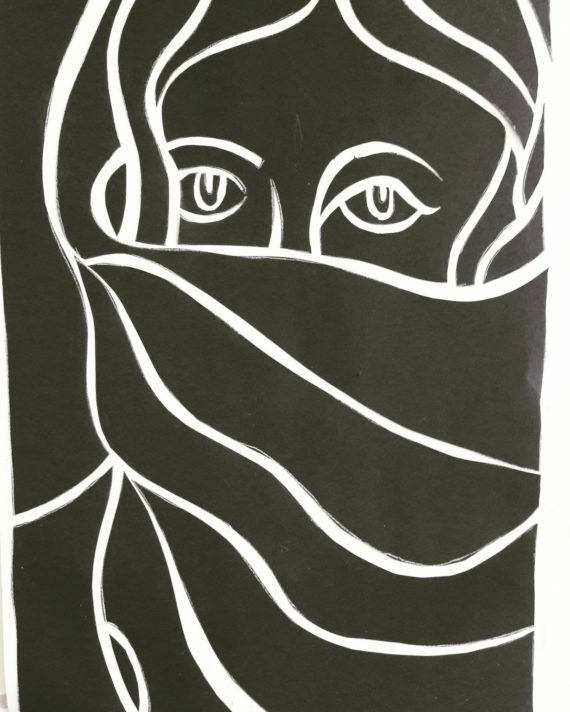 The design is a woman with her face covered; in Indian culture and also a variety of different religions such as Hinduism, Islam and Sikhism, all prevalent religions in Indian culture, modesty is very important. For this reason I have drawn the woman with her head covered with a scarf. However during my travels I have met lots of women who choose to oppose these traditions and therefore I have chosen to make the woman in my design have a deliberate gaze with the viewer, this is confronting and challenging, the complete opposite of modesty. I have chosen to work big for this piece of work, as this is also the opposite of modesty. If something is small, it is intricate and hidden, and forces the viewer to look closely. If something is big, it forces the viewer to look, whether they want to or not. This is similar to the attitude and purpose of someone who is fighting against culture and traditions. These women are inspiring to me, as they aim to be who they are rather than who society wants them to be. After cutting out the stencil for my screen print, I started printing. I chose a large scale A0 to do my print. The large scale and screen is powerful and forces to viewer to look. 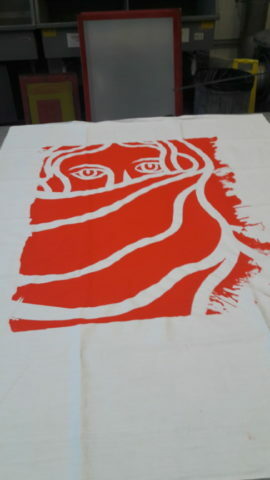 I chose to print them in a bright red colour, also due to this as the colour red in big and bold and powerful. Red also has links to Indian culture as it is a colour used in marriage ceremonies, in the clothing, its in spices and colours of paint used for festivals. The printing process itself was very difficult. 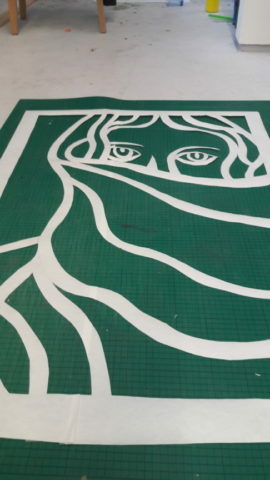 I had made the stencil so big that I could not reach the other side of the screen and had to ask for the technicians help. I had also neglected to leave an area for the excess ink to sit, which meant there was not a lot of room to move the ink around the screen. 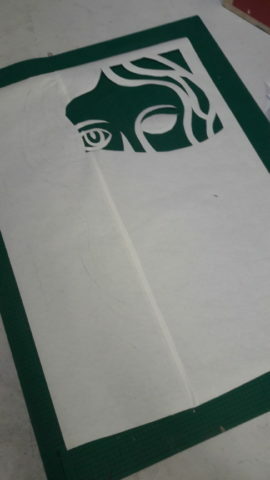 Due to the size of the screen and the stencil beneath the screen, the edges of my screen print also didn’t show up and left untidy marks on the sides of the print. This is due to the screen being taught at the edges and the ink will not penetrate through the screen to the paper below. 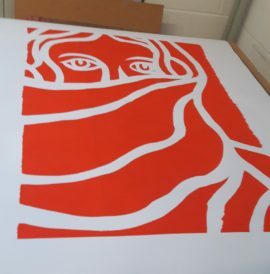 In future print, I am going to look into using a smaller stencil and rather than doing one large scale print using smaller screen prints in layers to build up a larger image. I am also going to alter my image to possibly include text. I think that there is links that I can see in my work to the way that the media exploits women and this is something I want to investigate further. This could be through text and use of image. I also want to try to use different colours with this piece, as I want to see what the different colours effect the work. Overall I do like the natural marks and traces of the process of printing, that were left behind in these prints that I have made. This is something that I want to develop and take forward. 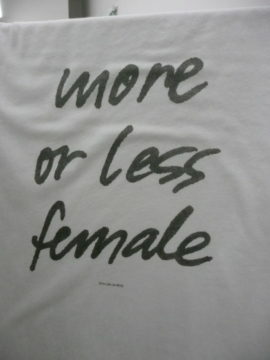 It has been suggested to me to look at the work of Christopher Wool, who uses screen printing in his own practice. He uses text and image and it is also possible to see the layers and join marks of the screens as evidence of the process. I went to see the turner prize 2016 at the Tate Britain, which was won this year by Helen Marten. 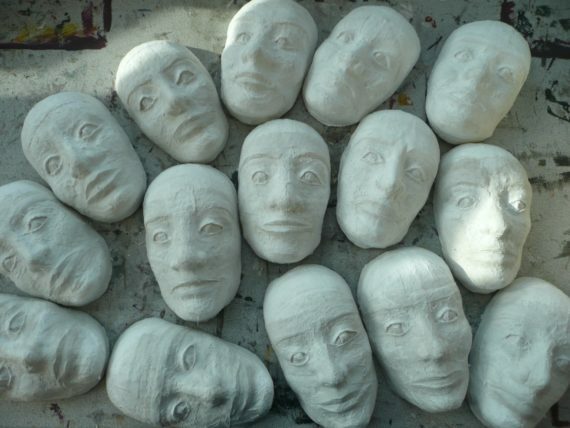 I was particularly inspired by her work; in terms of the way that she combines sculpture with printing. 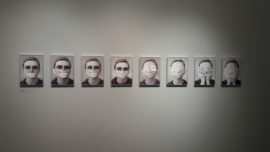 Her work featured screen prints, combined with the everyday object/readymades. This for me is something that I want to look at my own work, as I like sculptural printing and the combination of sculpture and print together to make work that is an installation. In my own work I am interesting in displaying the print plate with the print, as an element of trace in the work and also to show the process. I am not bothered by the accidental traces and marks in the print as to me this is part of the work and is what makes the work individual. I also liked the work of Anthea Hamilton, whose piece in the turner prize exhibition was an idea for a doorway, which featured a large bottom, where the gap between the legs makes the opening to the doorway. I really liked this piece as last year I was working on large-scale sculpture and this piece fitted in really well with my project. The piece also fitted with the themes that my work is currently looking at; women, exploitation etc. 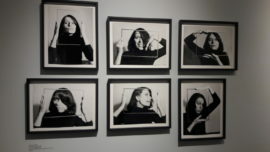 This exhibition was a collection of photography by feminist artists. 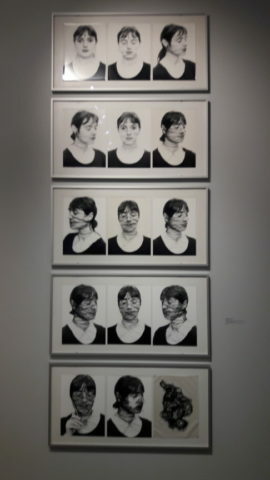 As both Myself and Lizzy are looking at empowering/exploitation of women in our work, we went to see this exhibition. 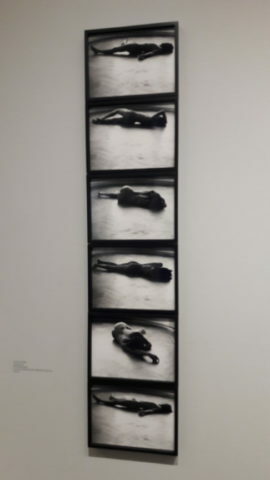 I really liked a lot of the pieces in the exhibition, especially those from the seductive body; sexuality and objectification section of the exhibition which featured several images from artists that focus on feminism from the point of view of objectification of women. Within this exhibition I particularly liked the way that there was a lot of pieces where multiple images were displayed together as a collage of image. I really liked this style and this was also something that I saw whilst in the Czech Republic. I went to see the Guerrilla Girls exhibition at the Whitechapel gallery whilst on the university trip to London. In 1985, a group of feminist activists in New York donned gorilla masks and took the names of famous women artists of the past. These art world superheroes, known as the guerrilla girls, produce posters, banners, project, using facts and humour to expose sexism, racism and corruption in art, film, politics and culture itself. The new exhibition is revisiting their work in 1986 called “Is it even worse in Europe”. In this piece the Guerrilla girls looked at sexist and racist facts from Europe at the time. 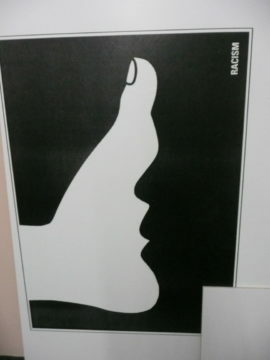 The new exhibition at Whitechapel was examining the sexism and racism in todays Europe, which are especially relevant at the moment with the recent Brexit results. I personally was expecting a lot more from this exhibition than what I actually saw. The exhibition was in a small, one room gallery, which meant that the poster and facts had been squeezed in. For me the composition of the work was wrong and needed more variety to the pieces and also to have more space between the posters and the viewer to allow the viewer to experience the work to its full rather than this exhibition where the work was difficult to see. 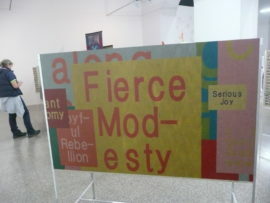 After arriving in Brno late on Saturday evening on Sunday we went to visit a number of modern art galleries around Brno. The first gallery included work of local upcoming artists and local students. The work was displayed in an inspiring and different way. 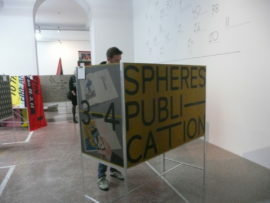 Exhibited in boxed tables. I was particularly inspired by the works that involved text as I found this emotive. The power of words and using opposite words to create a more emotive description of something. Some pieces of the work covered political and social issues that I am currently looking at in my own practise, racial issues, women’s rights, and equality. The second gallery that we went to featured a lot more installation based works and sculptural work. 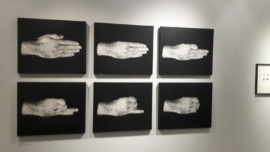 This would be something that I am interested in developing in my own practice as I like the idea of being interactive and involving the viewer. The third gallery that we visited had video work and again played the power of words. 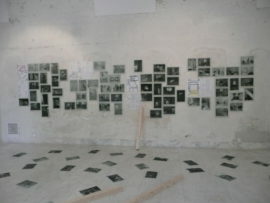 There were words on the floor that drew my attention and also repetitive photographic images on a screen. 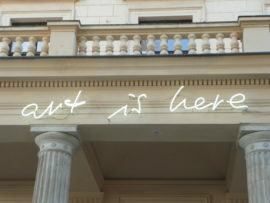 This allowed the viewer to make the connection between the words and the subject of the images on the screen. We also went to see the catacombs under the church, which contained the skulls and bones of the individuals buried there from hundreds of years ago. It was interesting to see but it was not an area of the trip that particularly inspired me towards my artwork, unlike a lot of the other students whose work for the week seemed particularly influenced by this experience. We travelled to UH in the late afternoon. We had a visit to the prison in the morning, taken by Zdena and Veronika who would look after us for the week, We were staying in the old army barracks, the school was the old police station and the prison that we would be exhibiting in and inspired by was made in the 2nd world war and the used as part of the communist regime to imprison, torture and ultimately execute prisoners, who were usually political subjects but could also be local farmers etc. 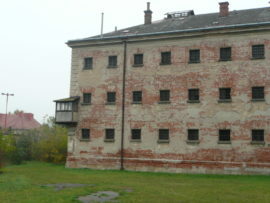 Walking around the prison for the first time that morning was a highly emotive experience. I was trying to get a feel for the environment that I was in. I was trying to think about emotive words to describe the prison and thinking about whether or not the prison and the work that I would be doing is about the empty prison building or about the atrocities that happened there. I chose to loom at the building itself as I felt that due to the environment that we were in and the people in the town we were in, it would be disrespectful for me to try to highlight the issues that these people went through when I cannot empathise with them. 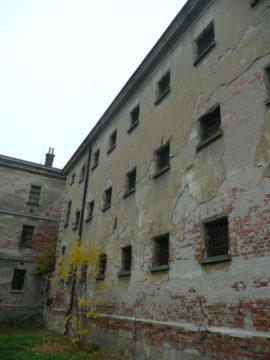 I did some small sketches whilst inside the prison itself and took some photographs for reference later on. We were that shown to our studio space in the ceramics building of the secondary school. In the afternoon we were shown around the ceramics and sculpture school. First we went to the sculpture department, which was very insightful and inspiring. The students at the sculpture school were being taught traditional methods of carving, where they were being taught how to carve a lions head out of sandstone. It was incredible skill. After visiting this we all took part in a pottery/ceramics class. We got to learn how to use the pottery wheel and each of us took it in turns to make a pot on the wheel. I had a few goes as initially I found it incredibly difficult, but it gradually got easier and in the end I managed to make a pot after a couple of goes that I was happy with. We had a morning session in the print room making dry point prints. I have done this process before as part of my assessment work from last year studio practise. However I found this session interesting, as it was good to see the differences between the process that I use in the UK and the process that they use here. They use a different ink which is oil based and appeared to be a lot thinner than the ink that I use. 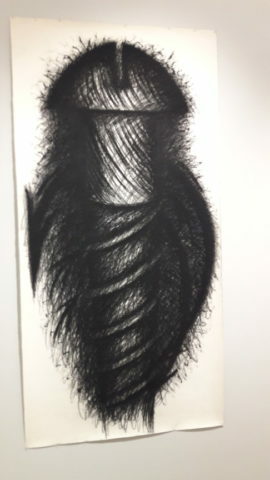 The ink was also very oily which I think affected the print. It meant that the ink was a lot harder to clean off of the plate and therefore left what I think is a dirtier print. There was not as clean crisp lines. In the afternoon we worked in the studios and I developed my drawings and ideas for the exhibition. We did not have a lot of time allocated to make the artwork so we had to work hard and quickly to get in done in time. We had to have a idea of what we wanted for the exhibition and work towards it without a lot of change in order to achieve what we wanted. 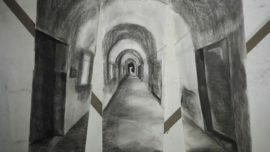 In the studios I developed my drawing and photos from the prison into developmental drawings. 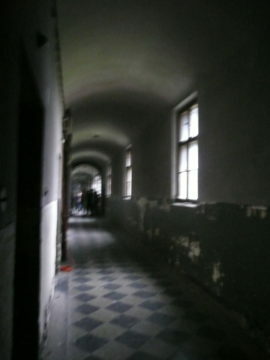 I focussed on the hall and corridor of the prison as I felt this area of the prison had the greatest feeling for me. 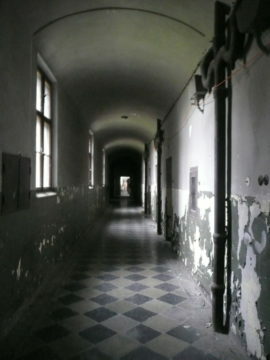 I felt that the corridor had a feeling of entrapment but also a feeling of freedom. You can spread out down a corridor, you can walk up and down and the corridor is the journey towards the freedom of the outside. It even has windows to the outside word. 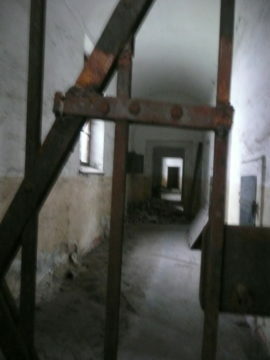 However for the prisoners in here it would have felt like entrapment, the windows barred up and the big metal gates, sectioning off parts of the prison. I worked on my ideas for the piece. I wanted the piece of work to be one drawing however I wanted the drawing to be split up in 3 sections of the drawing. They would be displayed by being hung at different depths within on of the prison cell. This would give an impression of opening up the cells so people can walk through the drawings and give the illusion of one drawing when looking at it from a distance, to show that feeling of freedom as if to open up the space. In the morning we had a tour of the main school looking round all the different departments. The work being made was very good especially in the drawing and painting department, where we observed in on a life drawing class. We then had a workshop in the multimedia department where we used a piece of technology called Alchemy to make virtual artwork, and using project we projected onto the wall the designs and patterns to the music. Personally this isn’t an area of art and design that I find interesting and I wouldn’t use it again, however I did find it interesting to talk to the Czech students that were doing the course and their ideas on artwork. I spent the afternoon working on my piece for the exhibition. 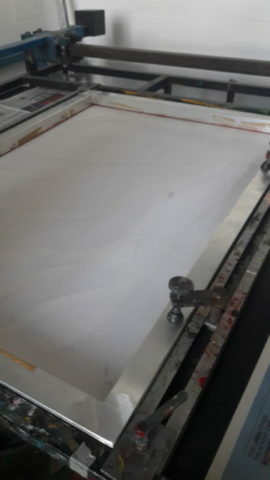 Working on large sheets of paper. 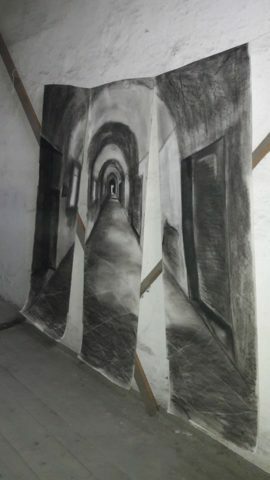 I made 1 large drawing in charcoal of the corridor of the prison. 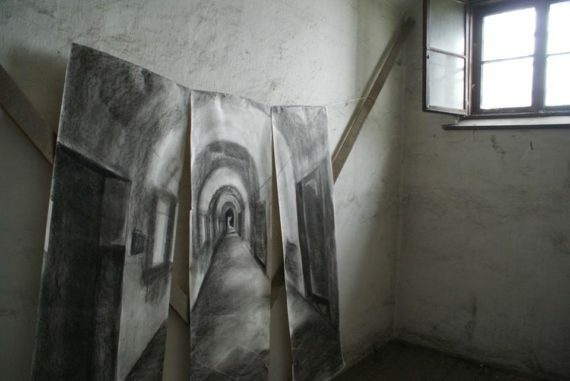 I was working from the drawings that I did in the prison and the photographs that I took. 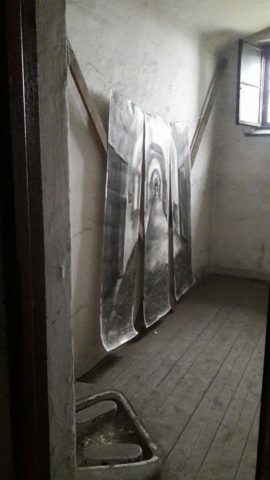 This in itself posed quite a challenge as the drawings that I had done in the prison and then the photos that I had taken were from a slightly different angle and had slightly different lighting to them. This made it hard to make that image so in the end I decided to do the final piece of work from the photograph. I used feedback from the other students to improve my work in stages. I received feedback about the windows that I needed to make them slimmer as they looked to wide. I also added the faint marks of the tiles on the floor to give the drawing depth. 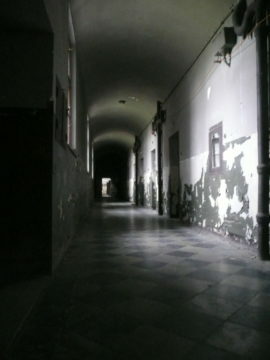 Finally I made the end of the corridor darker as at first it was too light and lacked depth. 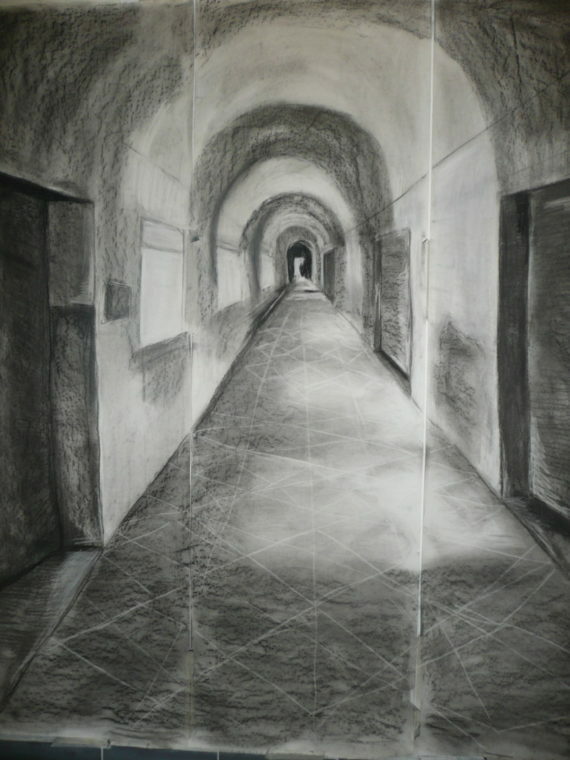 After I had added the darker patch, I realised that with the shadows that I had added there was the illusion that there was a person standing at the end of the corridor. This was not present in the original photograph but it was after I had drawn it and I like the coincidental nature of this. It also highlights the paranormal nature of the work. Exhibition day. 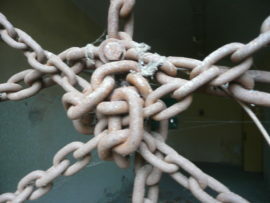 In the morning we moved our stuff over from the studios to the prison to start putting up and curating our exhibition. We each chose a space in the prison that we wanted to exhibit our work. 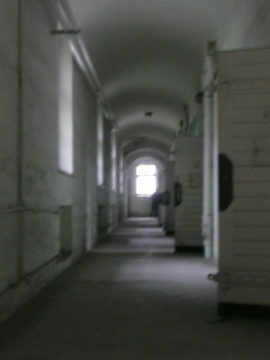 I chose to work in one of the prison cells as I felt this was an enclosed space, in which I could place my work. My work that I had made was intended to open a space up and I wanted to place it in a space that was very enclosed and trapping so that it gave the illusion of the space opening. The original idea was to have the pieces of work hanging at 3 different depths in the room. My original hanging idea was to have the work hanging from pieces of string attached at either side of the cell. This was not possible however as the wood supports that I had in place were not strong enough to hold the work. It made the work hang unevenly and this lost the effect of the work that I wanted. I therefore had to change my idea. I instead decided to use the wooden supports but cross them over against one of the walls. I then attached a piece of string across the supports and used this to hang my work against. This turned out a lot better than I had expected and I was really happy with the overall feeling that I managed to achieve. The exhibition was really great and lots of the students from the school turned up to view the work. We received some great feedback from the exhibition. Zdena told me that she was impressed that we had managed to produced as much work as we had in the time that we had been allocated. Many of the students from the school commented saying that really liked the drawing and the headmaster said that he was impressed with the work and that he liked the curation of the work. 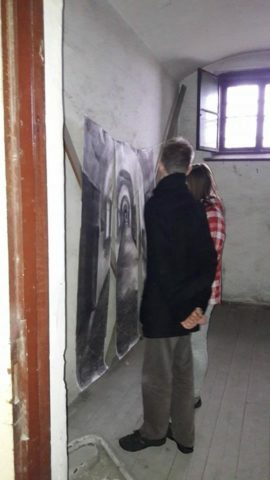 Trudy and John, UOS students, said that they liked the sense of depth that the work had, that the work opened up the enclosed room and showed the hopes that the prisoners had. 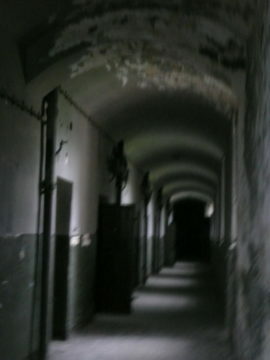 They also said that the work had a feeling of opening up the enclosed space as well as enclosing it at the same time. This is the title of a book written by Elizabeth Bumiller. She is a woman that went to live in India in the 1980s and 1990s and she was inspired by the stories of the women that she met whilst living there. This is something very close to my heart as whilst living out there I met many girls and women that have left a huge impression on me. They are powerful and beautiful but are inhibited by the culture of their country. This is something that has inspired me in the past with my foundation work. I have moved away from this inspiration in my second year work, focusing more on the traces of people. However I really want to go back to the inspiration of empowering women. I want to use traces of people in terms of the stories they make and the traces that they have in other people’s lives. I have been looking at saris, as they are the underlying way that women in India use to add personality and create their own identity. For this reason I have been looking at the colours and patterns that feature in some of the saris that I bought whilst I was working and living in India the first time that I was there. I chose to use the bright orange as the background, as this is the brightness that the women have underneath and then I put the dark colour over the top, this was to chow the controlling and trapping culture that they are trapped in. The colours are also inspired by the colours in my sari. 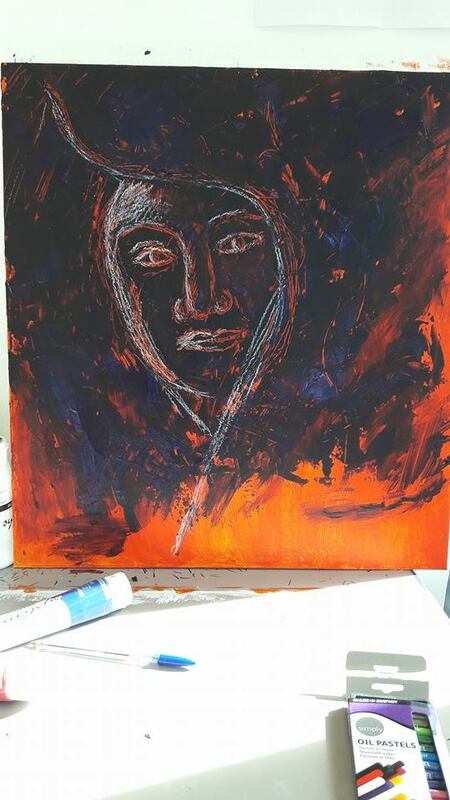 I then scratched into the wet dark paint the image of a woman with her head covered. This was good but quite hard to see, so I added the white oil pastel as another layer and help to show the face. I kept the image quite simplistic, as the traditional Indian paintings that I have come across in my travels are simplified drawings of the human figure. I am also looking at traditional cave wall drawings as a way of story telling and also a way of telling stories.